Business cards seem like they have been around forever. It seems like almost everything has gone electronic but people still use paper business cards in their workplace. I do and every one of my coworkers have business cards available to give to vendors, customers, or simply visitors. As you know, I think a clean desktop is very important. As a result, I really like the Officemate Cubicle Wall Business Card Holder that I purchased recently. It allows me to keep my business cards in a visible location on my cubicle wall and I always know where they are when I need to hand one out. I’m sure there are electronic methods of storing business cards today but I still think that the majority of people do still use the paper versions. There is something concrete about holding a well-made business card in your hand. The quality of a business card certainly will say something about you and your company. 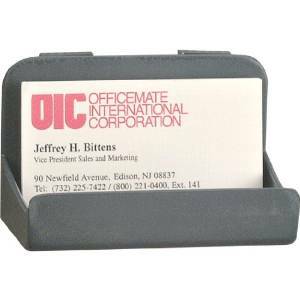 Here is a quick YouTube Video of this really cool cubicle wall business card holder. Attaches to cubicle panels with stainless steel needles. Great for freeing up your desktop. Keeps business cards in a handy, readily-visible location. If you still use business cards in your line of work and are perched in a cubicle like I am on a regular basis, this Officemate Cubicle Wall Business Card Holder may make sense for you. It’s a nice little addition to my cubicle environment. If you have any questions or comments you can contact me or leave it in the comments below. Awesome. I love using my cubicle walls for storage!